Is this a trick question? Both men would have had 2 oz of alcohol, but the guy who had the cocktail would have had a tiny amount of extra alcohol from the bitters. Hey Michael, that would be the answer if the question were worded so as to ask who had the most total liquor (the vermouth and bitters can count as liquor since they both contain distilled alcohol). But the question wasn’t about the total volume of liquor…. Which man has consumed more alcohol/ethanol? Hey Michael! You actually did the math! I am impressed! 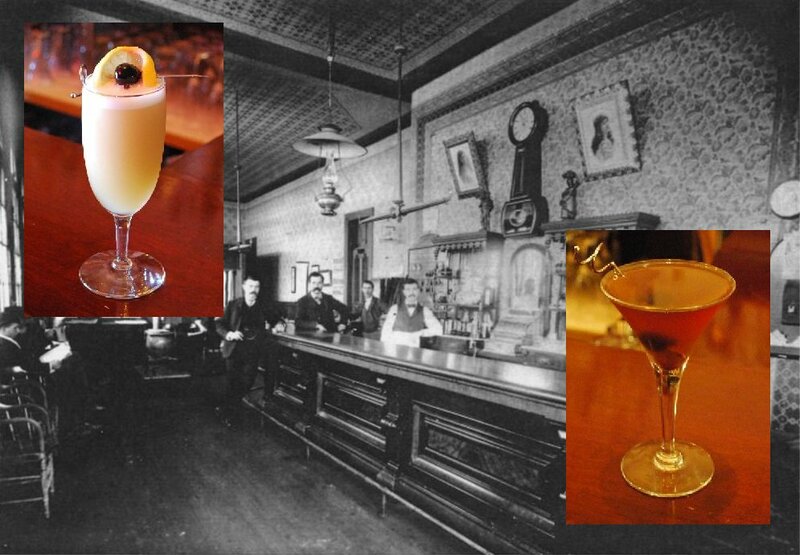 Yes, in 1895 any American bar would’ve made a Whiskey Sour with 2 fl-oz. of whiskey (probably about 50% alcohol) and the Manhattan Cocktail with 1 fl-oz. of whiskey and 1 fl-oz. of sweet vermouth (about 18% alcohol). So, even without doing the math, one can see that the Whiskey Sour had more alcohol. Very good, Michael! At the end it comes down to the recipes. It wasn’t until the Savoy cocktail book of 1930 that the manhattan became historically known as being just 1/2 sweet vermouth and 1/2 rye whiskey (Harry Craddock actually listed 4 different recipes for the manhattan in the book, but only 1 stuck. If they made it this way, the 2oz of whisky put in a whisky sour didn’t have nearly as much alcohol as this manhattan. Thank you for your comment. I love being challenged on my scholarship. It gives me impetus for checking and sharpening my pre-prohibition point of view. Looking at the book itself, I find that the recipe for the Manhattan Cocktail from Harry Johnson is not as you have submitted. I would be interested to see an image of the actual page of the book you quoted from. I suspect that modern unfamiliarity with the wine-glass as a unit of measure has caused some confusion. See the definitions below for clarity. I am going to quote a good number of pre-prohibition recipes for the Manhattan Cocktail. I will give them in chronological order, and you can find Harry Johnson’s from 1888 below. Please note that the majority consensus from these sources is that the Manhattan Cocktail was made with 1 fl-oz. each of whiskey and vermouth. Harry Johnson’s recipe from 1888 actually calls for 1 fl-oz. of whiskey and 1 fl-oz. of vermouth, since the actual text specifies half a wine-glass of each. 3 or 4 dashes Angostura bitters. ½ “ Italian vermouth . Fine ice; stir well and strain into a cocktail glass. Shake up well, and strain into a claret glass. Put a quarter of a slice of lemon in the glass and serve. If the customer prefers it very sweet use also two dashes of gun syrup. leave if for the customer to decide whether to use Absinthe of not. This drink is very popular at the present day. Into a small mixing glass place one-quarter teaspoonful of sugar, two teaspoonfuls of water, three drops of Angostura, one half-jiggerful of whiskey, and one half-jiggerful of vermouth; stir, strain into a small bar glass, twist lemon peel and throw in and serve with ice water on the side. Fill mixing glass half-full fine ice, add two dashes gum syrup, two dashes Peyschaud or Angostura bitters, one half-jigger Italian vermouth, one half-jigger whiskey. Mix, strain into cocktail glass. Add a piece of lemon peel or a cherry. Into a small mixing glass place two dashes of Orange bitters, two drops of Angostura bitters, half a jiggerful of Italian vermouth and half a jiggerful of Bourbon whiskey; stir thoroughly, strain into a chilled cocktail glass, twist and squeeze a piece of lemon peel over the top and serve. I think that the above collection of recipes establish that the standard, normal proportions between whiskey and vermouth in a pre-prohibition Manhattan Cocktail was equal parts of 1 fl-oz. each. Now, to be fair, William Schmidt published a recipe for the Manhattan Cocktail in 1892 that specified “⅔ drink of whiskey” and “⅓ drink of vino vermouth.” This would mean 1-⅓ fl-oz. of whiskey and ⅔ fl-oz. of vermouth – since the jiggerful was considered the appropriate amount of total liquor per drink of any type. Schmidt’s 2:1 Manhattan Cocktail is the earliest recipe that uses more whiskey than vermouth – unlike all other books from his era. But Schmidt’s Manhattan Cocktail still has less alcohol than his Whiskey Sour, because his Whiskey Sour contains a full drink of whiskey (2 fl-oz. ).